Having missed two weeks challenges owing to being on holiday (not that I had to think twice about that!) I've managed to cobble together an entry for this weeks LIM challenge. I was able to access the LIM blog on my Kindle and congratulations to everyone, there were some gorgeous entries! I have used a Creative Expressions stamp that I picked up at Ally Pally for £3.50, which I thought was a bargain for a large wooden stamp. I stamped with Stormy Sky distress ink and added some glitter.The sentiment was a free digi but I can't remember where from. I matted onto pale blue card with vintage ribbon behind and a couple of gems. The glitter trail covers a dirty mark!! Lovely card, love that stamp! Hi Val, thanks for your lovely comment. I think Blogger is playing up... if you notice no ones followers are visible! So now you can relax..it's not dementia! Beautiful elegant card. I love butterflies too. Gorgeous!! Love the butterfly - fabulous colour and sweet sentiment too. Beautiful! 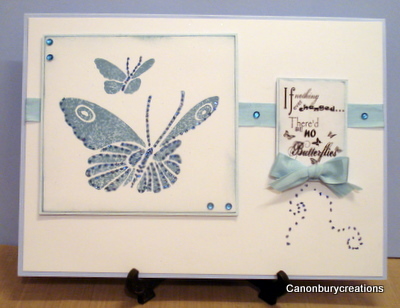 Love your butterflies and how you did the ribbon tx too! Don't you just hate it when you smudge your card! That happened to me twice last week! I love how you rescued the card! Love the butterfly, and the colors are great! Lovely butterflies and nice color !